We are not building just vehicles, landmarks and the map for ETS2, a lot of effort is going into elements that should make the Euro Truck Simulator world more alive, and the gameplay more interesting. Great job!you are doing one of the best simulating game ever!Can you show us a new renault magnum interior? WOW ! it's very good job ! Thank you SCS !! <3 It's very beautiful. Wonderful that Dutch traffic sign. At least, SCS makes things , we modders and map makers, were making for ages on previous SCS games ! This is the kind of stuff we like to see, more of these screenshots pls and more of roadsituations too ! SCS really if I see this I m pretty sure ETS2 will be a succes, I will buy it for sure, just because you guys listen to the community so much ! Thumbs up and a great job, just like the models of your trucks ! PS: DONT FORGET BORDER SIGNS and DISTANCE SIGNS ! its a dream who will be come true in my eyes!!! Damn, I love you for this! GREAT!GREAT!GREAT! SCS your are the best!!! 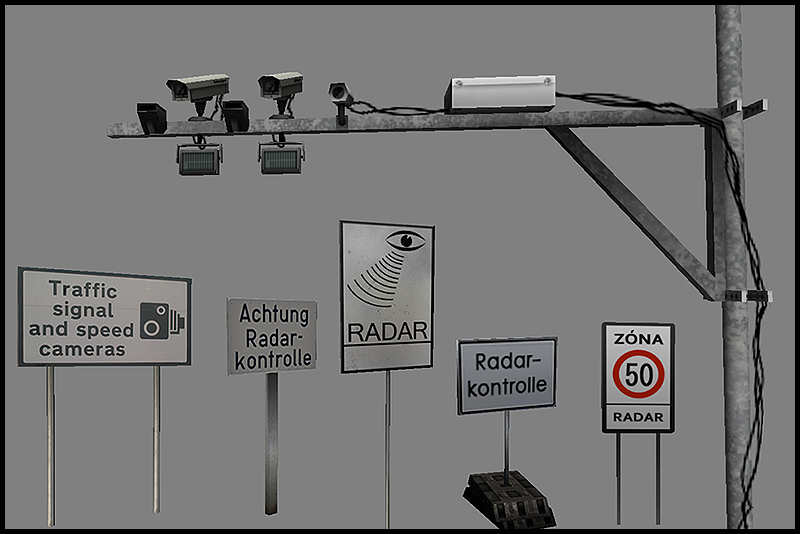 Great job SCS but if this sign called "Radarkontrolle" is for Germany you should not use it because it isn't usual in Germany. It's a known fact that feeling of reality lies in details. Things like this are exactly what gaming world needs to be believable. But this time, SCS, you surpassed all my expectations. These sings are so close to reality... bravo! I know, I know, it's really trivial detail. Don't take me too much seriously, I'm just saying it would be nice. Many thanks for your effort, really appreciate it! With when of the card images ? Greetings from Romania and : AWSOME GAME !!! Great Job SCS!Greetings From Greece! like you are in a hurry and drive somewhat faster,and then you see a radar is comming, then you need to brake in time, so you don't have to pay the fine, and all that stuff, really nice. Good job and keep it up! and also, don't forget distance signs, and lastly the mouse steering make it like in extreme trucker 2, that was the most realistic handle with mouse steering. Cheers guys, your my favorite developer! Nice work. But can you please add English translations to it, because I only speak English fluently. But very good approach. Much more interesting. Make stop signs as well, and place them all over the map. I don't know why you never include them. 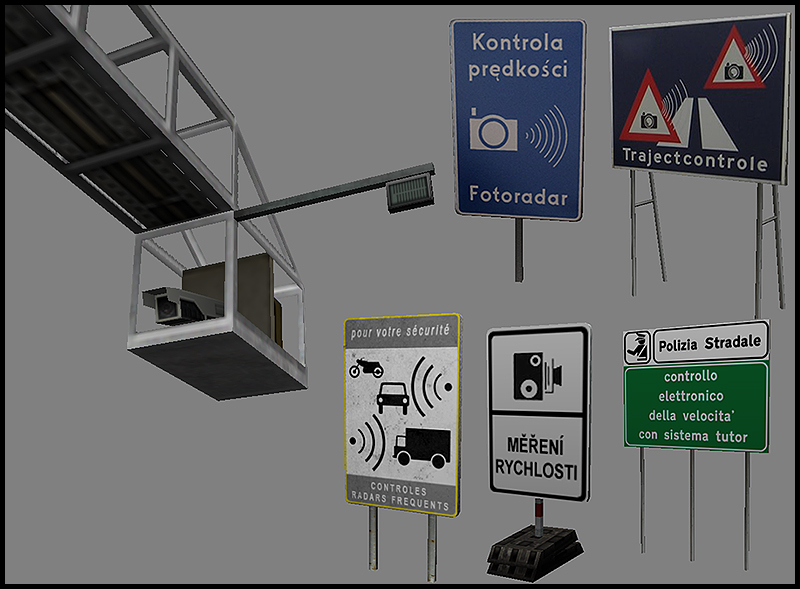 As a traffic sign "enthusiast", I love the fact that you include realistic signs in the game. Thank you! Scs make the cars can overtake in single roads PLEASE! will the signs have an effect on the gameplay. in example, that the driver has to stop and first pay and then drive on? That looks great! But can you please pulish a map for so far as you are? We would like to see the progress there. Yeah, as Janos said the more distinct detail for each country the better. Keep it up SCS ! Awesome. Keep up the fantastic work SCS Software team. Congratulations on the effort to make the game more real! It's perfect! Great job Guys! When you'll tell what countries the map will include ? I'm anxious. VladyF, they already told it in interview for one czech fansite. Plans should be slightly changend, but in present, they count with Great Britain, main part of France, BeNeLux, Germany, Czech Republic, Slovakia, Poland (probably only western part), Austria, Switzerland and northern Italy. Maybe they extend map in future by some addons, but it's nothing certain. I love you SCS ! which countries will be in ETS2??? SCS, if you can ban constant repeating of PEDESTRIANS IN ETS 2, please do so. It's getting rediculous. Please give in an put pedestrians in so that these messages go away. when will be released the ETS2???? It was just 65%. But now it's overall limited. Totally agree with you. That kid is obsessed. Btw, this is a really good update! The signs give an unique view of each country! I guess The Netherlands, Luxembourg and Belgium are collect in one region, the Benelux? Keep up the good work! congratulation SCS, but the speed camera and checkpoint operate in real time ? Regarding radar, does this mean speeding will not be caught by magic when not around such signs? 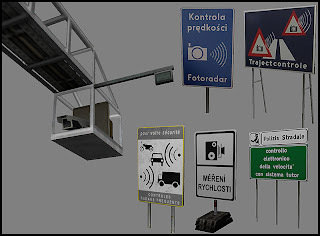 We dnt care about getting a ticket for speeding or how it will be done if implented, the signs are a nice step forward to more realism and diversity in the scenery of the game, the same thing is with new maps made by the community, they are better because people reskin and use models specific for each country. Nw scs does the same so great hope for this game and stop complaining about the same things over and over again. More important are signs and truck sounds and behaviour imo. nicely Done like every time! how many countries are there in the game? what do you have to show us about this? thank you SCS'you are GREAT! Personally i hope gameplay will be the same as in GTS and UKTS. Start as an employee, and gradually build up your truck empire. Only a nice feature would be to start with only a Sprinter or similar, than work yourself up to a truck, and last, to a semi-trailer. Thanks to SCS who puts all this work in a new game, really nice work!! Starting up as an employee is fun, well, at least for me. I like new models and signs ! Wow!!! Will you put anti-radar at upgrade stores? ETS2 will have working Tutor? I don't know how it works outside Italy, but here they have a time point to point. And minor control check to ensure that you don't cheat. I'm curious to know how you will implement this. Manter todos os idiomas originais das regiões. Tendo somente em comum o idioma do jogo. alemão na Alemanha, Inglês na Inglaterra. Tanks SCS, this is a best game, same a Gran Turismo of trucks. In Brazil we love this game.